There are great productivity improvements to be had by implementing an easy-to-use, graphical data collection application that supports modern, touchscreen devices. However, there are high costs, long implementation cycles, and application performance risks associated with migrating away from fast and reliable Terminal Emulation “green screen” applications. With StayLinked SmartTE you get the best of both worlds with No-Risk Application Modernization. You continue to realize the speed, reliability, and security of StayLinked TE while increasing productivity with the addition of an intuitive, modern user experience. Easily add a modern, graphical user experience customized for your touchscreen data collection devices. New user interface screens are generated automatically or created in the screen designer to suit your needs. Multi OS/Device Manufacturer support – StayLinked SmartTE supports the latest Android and iOS devices with Windows 10 Mobile coming soon. Fully transferable, concurrent connection licensing – Your StayLinked licenses will work forever on any device you choose. Additionally, you only need licenses for the maximum number of simultaneous server connections and not for every mobile device in service. “Future Proof” your TE applications – With a single StayLinked license you get the most reliable, secure, and fast terminal emulation with the option of adding graphical screens immediately or when it makes the most sense for you in the future. Migrate at a pace that makes sense without additional license purchases. Sharp focus on Terminal Emulation and related technologies – StayLinked is 100% committed to delivering the world’s best terminal emulation solution, customer support, and associated technology. TE is not a side product line for us - it is what we think about all day, every day. Rapid Implementation – Dynamically generate screens, test, and implement in a matter of weeks. 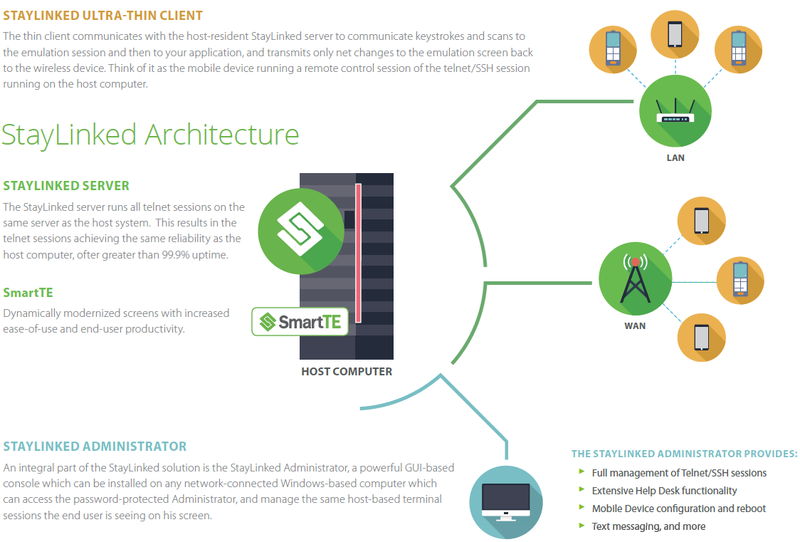 Auto-device detection – upon installation, the SmartTE client will adapt itself to the specific device's unique capabilities. No Changes to your existing application – With SmartTE you continue to use your existing, high-speed TE application with no revisions to that important code. The new SmartTE graphical screens operate independent of the mission-critical host application code. Architectural Advantage – Server-based design delivers TE session persistence, centralized administration/configuration, and troubleshooting. No programming required – SmartTE requires no specialized programming skills. Your application screens are automatically transformed into touchscreen-compatible screens or, if you require screen customization, you can use the StayLinked screen designer to enhance your screens further. Ultra fast performance – SmartTE delivers StayLinked's industry-best application speed. Reliability – StayLinked eliminates the #1 productivity killer in the warehouse – dropped terminal emulation sessions. In fact, StayLinked is as reliable as the host server that hosts your data collection application. No Dropped Connections – SmartTE’s unique architecture ensures telnet sessions are never dropped, even when devices are re-booted, its battery dies, or the user roams between WIFI and cellular networks. Performance – StayLinked delivers the fastest TE in the industry and SmartTE is built upon the same, high-performance architecture. Rich, graphical screens – End users see a familiar user interface supporting such actions as swipe, pinch, buttons, fields and more. Security – With Blowfish encryption, firewall-friendly design, application lock-down, and support for port filter and access list controls, StayLinked ensures the integrity of your data and communications.